More than 200 journalists and leaders of journalists unions and associations have converged in Dublin, Ireland for the 28th World Congress of the International Federation of Journalists (IFJ) which is expected to focus attention on media freedom, the safety of journalists and job security amid growing austerity measures in many countries. The 5 day event, which runs to June 7, kicked off yesterday with a meeting of the Gender Council, which discussed strategies for improving gender parity in journalists unions and associations at the national, regional and global levels. The Congress, which will today focus attention on job security for journalists under the themes “Decent Jobs, not Austerity’’, will officially be opened by the President of the Republic of Ireland, Michael D. Higgins. Kenya Correspondents Association (KCA), an affiliate of IFJ, is represented at the Congress by its National Chairman William Oloo Janak who is expected to speak about media freedom, safety and security of journalists and the uncertainty of jobs facing Kenyans journalists. “This is an important platform to discuss challenges facing journalists and we will highlight the case of Kenya given the problems journalists face, including increasing safety and security concerns and violation of journalists labour rights by employers,” said Janak in a statement from Dublin. The Congress is expected to discuss the killings of journalists in Somalia and other hot spots, the continued threats, intimidation, arrests and detentions of journalists in a number of countries including in Eritrea, Ethiopia, Rwanda, Tanzania, Uganda, Turkey, Iraq, Afghanistan, among others. On Wednesday June 5, the Executive Council of the Irish National Union of Journalists (NUJ) will lead the delegates in a “Freedom Walk” to remember the those journalists killed since the last World Congress in Cadiz, Spain in June 2010. 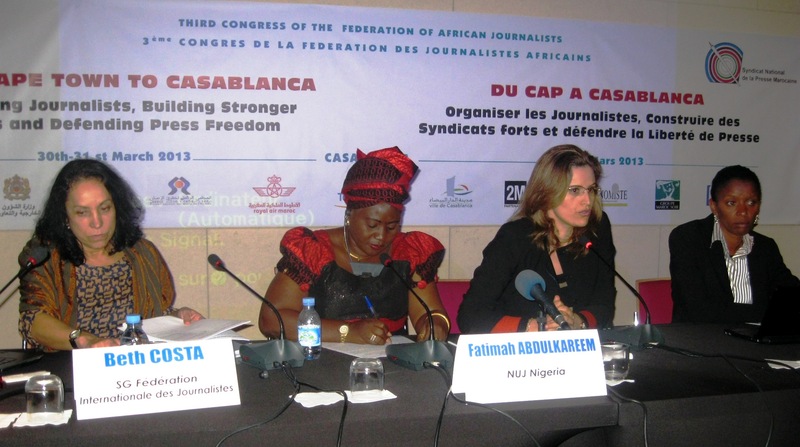 The Congress, which has representatives from over 110 countries, has a strong African delegation drawn from more than 40 journalists unions and associations under the continental grouping of the Federation of African Journalists (FAJ) which seeks to play an important role within the global journalists’ body. During the Congress, the delegates will elect a new leadership to steer the IFJ for the next two years till the next congress in 2015. The President of Ireland, Mr Michael D Higgins, has stressed the need to protect media diversity and pluralism at the opening ceremony of the International Federation of Journalists’ World Congress in Dublin last evening. Opening the World Congress, President Higgins warned of the dangers of “identifiable news organizations chasing the same narrow commercial ground” and emphasized the importance of a free press to democratic society. “Pluralism, real diversity and choice are critical and should never be reduced to a false choice between partisan media arrayed on ideological grounds, and identified news organizations chasing the same narrow commercial ground,” President Higgins told over 300 delegates gathered at the opening ceremony in Dublin’s historic Royal Hospital Kilmainham. The President of Ireland was welcomed at the opening by IFJ President, Jim Boumelha, who endorsed his call for free and democratic media across the world. The theme of the IFJ Congress, which is hosted by the National Union of Journalists of Great Britain and Ireland is Leading the Global Fightback. President Higgins said the recent reiteration of the principles of World Press Freedom Day on 3 May by the member countries of UNESCO was an important act of solidarity. President Higgins stated that if the commitment was to be of real value there must also be a commitment “to turn human rights aspirations in this area from aspirations into guarantees”. He outlined the challenges facing journalists including the concentration of ownership, the convergence of technologies, the fragmentation of audiences, the com-modification of experience, are all elements of the changed circumstances in which journalism is, and will, be practiced. “Journalists attempting to investigate and provide information on political and corporate corruption can often be hindered and intimidated by those with vested interests, including by use of violent means; which, if acceded to, would lead to a dangerous misrepresentation or even falsification of information which would not be in the interests of individual citizens and would obviously be detrimental to society at large,” said President Higgins. A study published jointly by the European and the International Federation of Journalists (EFJ and IFJ) has shown that women in Europe make up more than a third (42%) of journalist’s unions membership and leading positions (36%). “Although the trend for improved representation cannot be considered to be reversed our unions must remain vigilant as the gender equality issue is far from won”, said IFJ General Secretary Beth Costa. “These results will help us launch focused actions supporting women in union membership and their access to leading roles”. The survey aims to assess progress made in reducing the representation gap between women and men in journalists’ trade unions. It also examines the number of young women with youth membership, as well as freelance and permanent staffers’ membership. It presents an overview of union gender policies adopted by IFJ/EFJ affiliates in Europe and assesses to what extent the financial crisis has affected women and youth journalists more specifically than men in the profession. The EFJ recently elected a woman as its vide-president. The IFJ will hold its congress at the beginning of June and will decide upon its new leadership. “The up-coming IFJ congress will be a good opportunity to tackle gender equality within our leadership,” said Costa. “We are taking important steps to allow this to happen by adopting a gender mainstreaming approach throughout congress. We hope that this will encourage women to stand for elections and actively participate in congress activities”. The International Federation of Journalists (IFJ) congratulated its regional group, the Eastern Africa Journalists Association (EAJA), and its affiliates on the successful conclusion of EAJA’s General Meeting and Strategy Conference which took place on 25-27 May 2013 in Addis Ababa, Ethiopia.“We salute members of our regional organization, EAJA, for the successful conclusions of EAJA’s General Meeting and Strategy Conference. By arriving Addis Ababa to fulfill constitutional duty, journalist unions in Eastern Africa have made us and the journalists of Africa proud and have once more secured the EAJA they want,” said Gabriel Baglo, IFJ Africa Director. The General Meeting is EAJA’s supreme decision-making body. It was attended by 21 delegates from 10 unions and associations from Burundi, Djibouti, Ethiopia, Kenya, Rwanda, Somalia, Sudan, Tanzania and Uganda. They have mandated EAJA to carry out a strategic plan during the next five years. This commits EAJA to strategically promote and defend media freedom and trade union rights. Delegates were also able during the meeting to vote for progressive constitutional amendments to enhance EAJA’s governance. The Meeting elected an Executive Committee and Internal Audit Committee. Dr Muheldin Ahmed Idriss from Sudanese Journalists Union was elected as President; Alexandre Niyungeko from Union of Burundian Journalists (UBJ) was elected as first Vice President, Anteneh Abraham Babanto from Ethiopia National Journalists Union (ENJU) was elected as second Vice President, Omar Faruk Osman from the National Union of Somali Journalists (NUSOJ) was re-elected as Secretary-General, Jane Uwimana of Rwanda Journalists Association (RJA) was elected as new Treasurer while Maureen Mudi from Kenya Correspondents Association (KCA) and Kenedid Ibrahim Hussein from Association of Djibouti Journalists (ADJ) were elected as Executive Committee members. “We especially congratulate the elected leaders of EAJA. Delegates showed maturity in democracy. We look forward to working closely with them and maintaining a productive relationship with EAJA leaders,” added Baglo. The General Meeting for the first time elected a five-member Regional Gender Committee (RGC) to foster gender equality in EAJA affiliated organizations and the media in the region. The delegates unanimously approved the organization’s last three years’ activities report. The meeting set the agenda for the next three years and passed resolutions on state of press freedom and trade union rights in the region particularly in Eritrea, Ethiopia, Burundi, Somalia, Sudan and Uganda. It also approved financial report presented by the outgoing Treasurer of EAJA Gaspard Safari. In his closing address the re-elected EAJA Secretary General Omar Faruk Osman thanked the International Federation of Journalists (IFJ) for its help in organizing the General Meeting and Strategy Conference. “This has been the biggest, most effective and representative General Meeting in EAJA’s history. The ten organizations represented here want EAJA to be an even more action-oriented organization,” said Omar Faruk Osman. “In this General Meeting we have taken decisions on championing media freedom, on building strong organizations and on fighting for trade union rights that will strengthen journalists and other media workers everywhere in the region,” he added. The president of EAJA Dr Mudeldin Ahmed Idriss thanked delegates for the renewed confidence and support. “We must now intensify our efforts to build strong organisations both at regional and national levels. At the end of this period, we must be able to report back to the next General Meeting about what we have done, not on why we didn’t do it. EAJA must invest a lot more into that struggle and members must play necessary role”. Jane Uwimana, Secretary General of Rwanda Journalists Association (RJA), becomes first woman Treasurer. She vowed to build strong financial base and appealed members to pay their dues and other financial contributions timely. The General Meeting unanimously voted for the re-admission of Kenya Union of Journalists (KUJ) and approved admission of Uganda Media Union (UMU) into membership, raising the number of EAJA member organizations to eleven. The Vice President of the IFJ Gustavo Granero and Africa Director of the IFJ Gabriel Baglo attended the General Meeting and extended solidarity to EAJA and its member organisations, while renewing IFJ’s support to EAJA and affiliated organizations. Representatives from International Trade Union Confederation – Africa regional organization (ITUC Africa), Media Institute for Southern Africa (MISA) and Union of Central Africa Press (USYPAC in French) attended the meeting to extend fraternal greetings and solidarity to EAJA and its member organizations. The three yearly General Meeting and Strategy Conference of the Eastern Africa Journalists Association (EAJA) closed on Monday, 27 May 2013, in Addis Ababa, Ethiopia, with the Regional Association committing itself to further escalate its campaigning activities in press freedom and trade union rights. The General Meeting is the EAJA’s supreme decision-making body, and during the meeting the 21 delegates from 10 unions and associations from Burundi, Djibouti, Ethiopia, Kenya, Rwanda, Somalia, Sudan, Tanzania and Uganda have mandated EAJA to carry out a strategic plan during the next five years. This commits EAJA to strategically promote and defend media freedom and trade union rights. Delegates from affiliated unions and associations were able to vote to progressive constitutional amendments to enhance EAJA’s governance. The Meeting elected an Executive Committee and Internal Audit Committee. Dr Muheldin Ahmed Idris from Sudan Journalists Union was elected as President; Alexandre Niyungeko from Union of Burundian Journalists (UBJ) was elected as First Vice President, Anteneh Abraham Babanto from Ethiopia National Journalists Union (ENJU) was elected as Vice President, Omar Faruk Osman from the National Union of Somali Journalists (NUSOJ) was elected as Secretary-General, Jane Uwimana of Rwanda Journalists Association (RJA) was elected as new Treasurer while Maureen Mudi from Kenya Correspondents Association (KCA) and Kenedid Ibrahim Hussein from Association of Djibouti Journalists (ADJ) were elected as Executive Committee members. The General Meeting for the first time elected a five-member Regional Gender Committee (RGC) to foster gender equality in EAJA, affiliated organizations and the media in the region. The delegates unanimously approved the organisation’s last three years’ activities report. The meeting set the agenda for the next three years and passed resolutions on state of press freedom and trade union rights in the region particularly in Eritrea, Ethiopia, Burundi, Somalia, Sudan and Uganda. It also approved financial report presented by the outgoing Treasurer of EAJA Gaspard Safari. In his closing address the re-elected EAJA Secretary General Omar Faruk Osman thanked the International Federation of Journalists (IFJ) for its help in organizing the huge General Meeting and Strategy Conference, and said: “This has been the biggest, most effective and representative General Meeting in EAJA history. The ten organizations represented here want EAJA to be an even more action-oriented organization”. “In this General Meeting we have taken decisions on championing media freedom, on building strong organisations and on fighting for trade union rights that will strengthen journalists and other media workers everywhere in the region”. The president of EAJA Dr Mudeldin Ahmed Idris thanked delegates for the renewed confidence and support, and said, “we must now intensify our efforts to build strong organisations both at regional and national levels. At the end of this period, we must be able to report back to the next General Meeting about what we have done, not on why we didn’t do it. EAJA must invest a lot more into that struggle and members must play necessary role”. Jane Uwimana, Secretary General of Rwanda Journalists Association (RJA), becomes first woman Treasurer. She vowed to build strong financial base and appealed to members to pay their dues and other financial contributions timely. The General Meeting unanimously voted for the re-admission of Kenya Union of Journalists (KUJ) and approved admission of Uganda media Union (UMU) into membership, raising the number of member organizations of EAJA to eleven. The Vice President of the IFJ Gustavo Grenaro and Africa Director of the IFJ Gabriel Baglo attended the General Meeting and extended solidarity to EAJA and its member organizations, while renewing IFJ’s support to EAJA and affiliated organizations. Representatives from International Trade Union Confederation – Africa regional organisation (ITUC Africa), Media Institute for Southern Africa (MISA) and Union of Syndicates of Central Africa Press (USYPAC) attended the meeting to extend fraternal greetings and Solidarity to EAJA and member organisations. The International Federation of Journalists (IFJ) today has vigorously condemned the kidnapping of a television journalist in Nigeria. According to Nigeria Union of Journalists (NUJ), an IFJ affiliate, Olubunmi Oke a reporter and newscaster with the Nigerian Television Authority (NTA), her baby and maid were taken Thursday March 21 by four men who blocked her car as she was leaving her office in Akure, capital of Ondo state (South West). Her baby and maid were released later while the car was found in another town. The reason of the kidnapping is unknown. “We are deeply concerned by the kidnapping of our colleague. We call on security forces to do their best to ensure her safe return, and stand in solidarity with her family and colleagues,” said Gabriel Baglo, IFJ Africa director. The IFJ raises concern about the personal security of journalists in this context of violence in some parts of the country. On 26 April 2012, two suicide car bombers targeted offices of Nigerian newspaper This Day in Abuja and a Media house in Kaduna. Arrests of journalists are also frequent. On 24 December 2012, journalists Musa Muhammad Awwal and Aliyu Saleh from weekly Al-Mizan, a Hausa-language newspaper, have been arrested and detained by the security forces without clear charges. They were then released. The journalist Ikechukwu Udendu, editor of Anambra News a monthly newspaper, was shot dead on Saturday 12 January 2013 by unknown persons. “We call on journalists to have personal safety protocol and ask authorities to bring to court all perpetrators of attacks against journalists,” Baglo added. The President of Nigeria Union of Journalists (NUJ), Mohamed Garba, has been elected in Casablanca (Morocco) as the new president of the Federation of African Journalists (FAJ) following the third congress of that continental body representing the interests of over 50,000 journalists in Africa. Mohamed Garba replaces Omar Faruk Osman Nur, who served as FAJ President for the past six years. 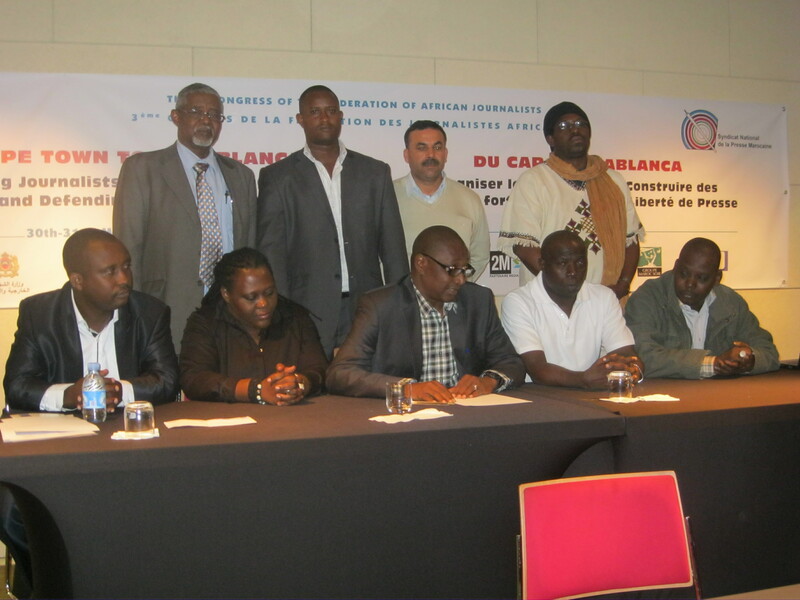 http://www.africanpress.me/ – Newly Elected members of the FAJ Steering Committee immediately after their election in Casablanca, Morocco. http://www.africanpress.me/ – http://www.africanpress.me/ – Newly Elected members of the FAJ Steering Committee immediately after their election in Casablanca, Morocco. 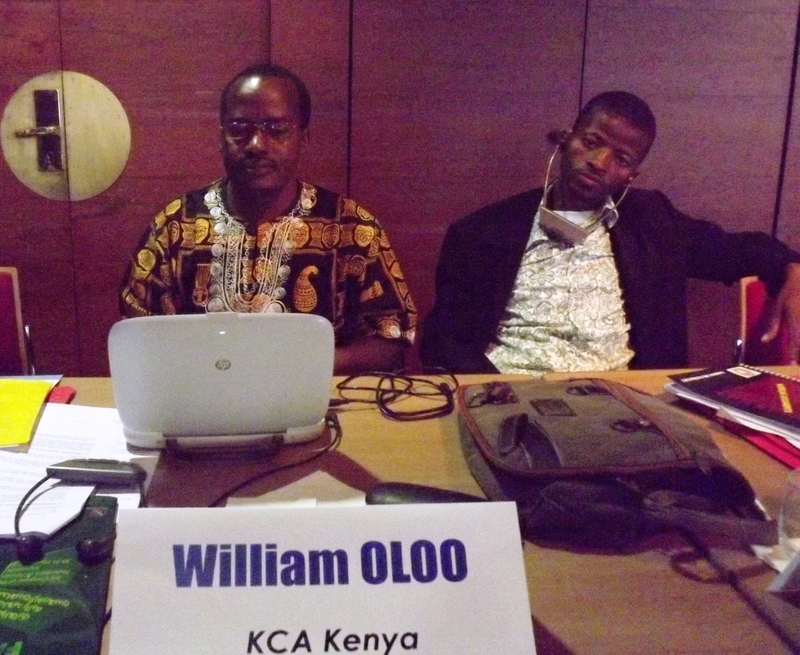 http://www.africanpress.me/ – Members of the FAJ Elections Board consult during the conference and elections. The Congress in accordance with Article 9.4 and 9.5 of the FAJ Constitution, elected a 9 members steering committee, which later elected Mohamed Garba as the new President. In the same vein, Maria Louisa Carvalho of the Angolan Journalists Union was elected as the Vice President of the Federation, while Stanis Nkundiye of the National Syndicate of Media Professionals in the Democratic Republic of Congo retains his position as the Treasurer of FAJ. Other members of the Steering Committee include Ibrahima Khalilloulah Ndiaye (Senegal), Alexandre Niyungeko (Burundi) Muheldin Ahmed Titawi (Sudan) Credo Tetteh (Togo) and the former Vice President of the Federation, Foster Dongozi, from the Zimbabwe Union of Journalists (ZUJ) and Mouhamed Bchir Chakakou (Tunisia). Three reserve members to the Steering Committee were also elected namely, Edouard Adzotsa (Congo Brazzaville), Collin Haba (Rwanda) and Rolland Affail Monney (Ghana). In his inaugural speech to the participants at the Congress, FAJ new President Mohamed Garba, said that the primary concern of the new Steering Committee will be to unite the affiliates in the continent and moreover to ensure that unions in the continent are strengthened in order for them to defend the rights and welfare of their members. The Steering Committee, he emphasised, cannot do their work effectively without the existence of strong unions. “We will endeavour to confront the major challenges before us and will always do the best we can to promote respect of the rights of journalists and to promote quality journalism in Africa”. Mohamed Garba paid tribute to the outgoing FAJ President, Omar Faruk Osman Nur, who he said had demonstrated a lot of determination for the past six years to ensure that FAJ meets objectives that it has set out for itself at its inception. This new Steering Committee, he said, will utilise that working programme set up by the former Steering Committee, and will not at any time hesitate to contact and consult with Faruk, in order to tap from his wealth of experience. 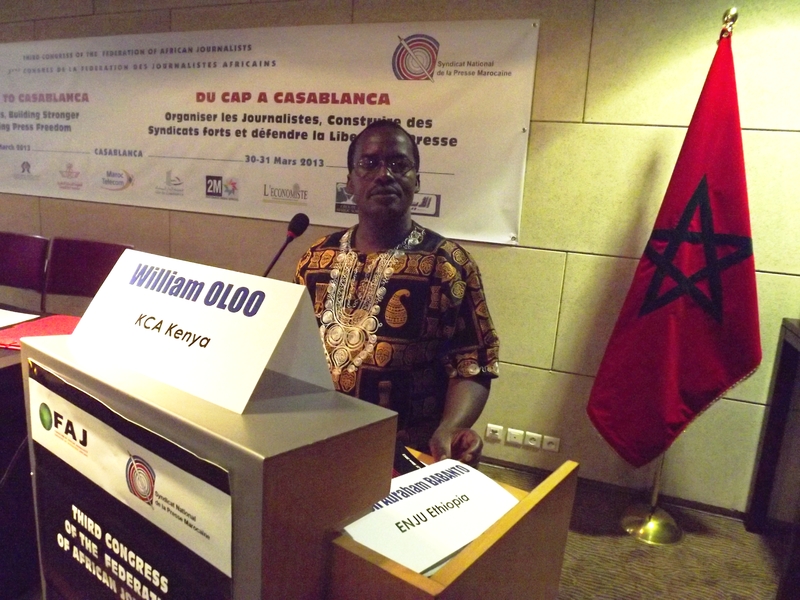 FAJ President Mohamed Garba thanked the Moroccan Union of Journalists for hosting the Congress. He also thanked the IFJ President, Jim Boumelha for his unflinching support to the unions in the continent and his commitment to ensure safety and protection of journalists in Africa and the world at large. He assured the IFJ President that he will continue to work with the IFJ in the most effective manner and will make its doors continuously open to all the regional associations in the continent. This two day congress was the occasion for delegates from 34 countries to have a look at the governance and policies of the Federation. Delegates scrutinised and discussed the activities and financial reports, debated and approved motions, reviewed constitutional amendments and working programme for 2013-2016 as well as elected new leaders. Delegates also addressed pressing issues facing journalists and their organisations such as increased attempts to criminalise journalism work, working conditions in the media industry, gender equality, safety of journalists and impunity. For the first time since FAJ has been created the congress included an event specifically dedicated to the working programme to achieve gender women equality. The pan-African gender council committee has been formally put in place sanctioned by the congress, making FAJ the first IFJ continental federation that has special structures dedicated to address the needs, interests, and issues of women journalists. In this regard, the congress elected Mrs Mounia Belafia (Morocco), Fatima Abdulkareem (Nigeria), Carla Lima (Cape Verde), Angele Chisimba (Zambia) and Kadiatou Diallo (Guinea Conakry) as members of the gender council committee. Delegates said they are very confident on the new FAJ leadership on which they are expecting to score more key successes to promote and protect the rights of journalists. 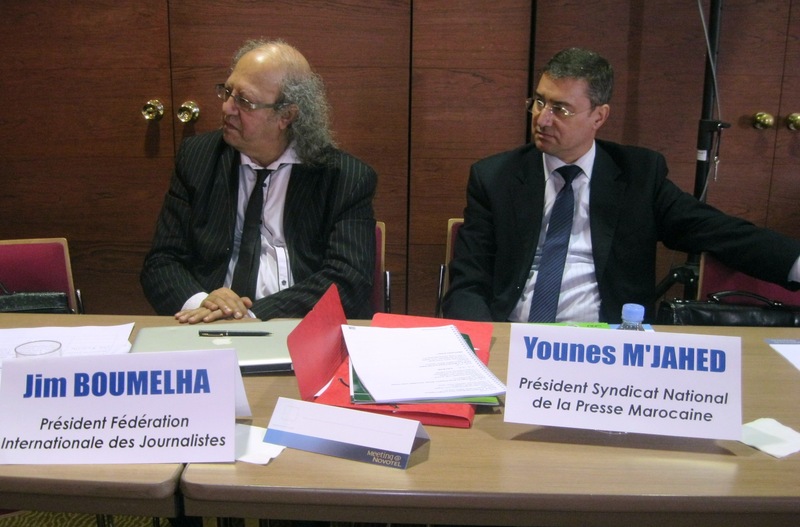 The congress was hosted by the Syndicat national de la presse marocaine (SNPM). Younes M’Jahed president of SNPM expressed deep pleasure to welcome delegates in Morocco, and called on them to develop more solidarity and to stand up together for a better recognition of the work of journalists in Africa. FAJ over the years has received recognition and support from its parent organization, the International Federation of Journalists and claims the position of legitimate voice of journalists and journalism in Africa. Delegates asked the new leadership to rebrand its image in order to maintain a high-level profile with partners and the trade union movements. 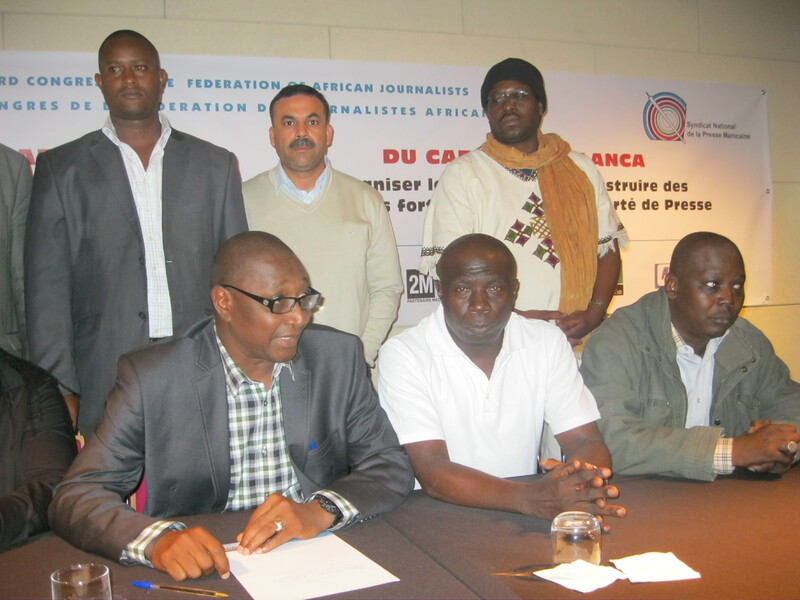 The third continental congress of the Federation of African Journalists (FAJ) held in Casablanca, Morocco ended with a call for organising journalists, building stronger unions and defending press freedom in Africa. The event which is hosted by the Syndicat national de la presse marocaine (SNPM) is attended by 38 delegates from 34 countries in Africa. Journalists’ trade unions and associations affiliated to the International Federation of Journalists have formed since 2008 a continental body representing the interests of their members in all media sectors either electronic, broadcasting or print, working as reporters, presenters, producers, freelancers or even editors at national, regional and international levels with the common objective to work to improve the social and professional rights of their members, be they full-time or freelance. Speaking at the opening ceremony, Jim Boumelha, president of the International Federation of Journalists (IFJ) said strengthening the pan-African solidarity among journalists is a very important objective, because Africa needs good journalists practicing good journalism, freely, safely and professionally. Looking at FAJ’s report of activities and programme of work, Boumelha stated: “anybody who wants to know what you have achieved should read your document of work. They will of course realise the huge challenges you had to confront, from the issue of safety of journalists and impunity to criminalization of journalists, the fight for better working conditions and the implementation of international labour standards”. “They will see at the same time, how with very limited resources FAJ has set out to lift and upgrade its democracy and structures, to increase its capacity to confront employers and governments and to break the walls between media sectors and between men and women”. He called on FAJ members to consolidate their work on protecting the free flow of information which is a cornerstone for the IFJ’s mandate. “Indeed freedom of expression is imperative for sustaining development, consolidating democracy and initiating dialogue. And I am proud that you have taken it as a central battle line not only within FAJ but in many of your respective unions,” Boumelha added. Everywhere in Africa there are still many obstacles to freedom of expression and free press. Boumelha highlighted the issue of censorship, violence, intimidation and harassment of journalists, pressure and threats, poor working conditions, lack of financial resources and training as areas where FAJ can make a difference, while assuring them of the IFJ’s unflinching support. Approaching the issue of safety and security of journalists, Jim Boumelha said, in the past decade more than 2000 media professionals have been killed in the exercise of their profession, most of them victims of targeted killing and most of them local journalists working in their communities. On the other hand, the Minister for Communication of Morocco Honorable Mustapha El Khalfi, said the country’s commitment is to be a model for press freedom. 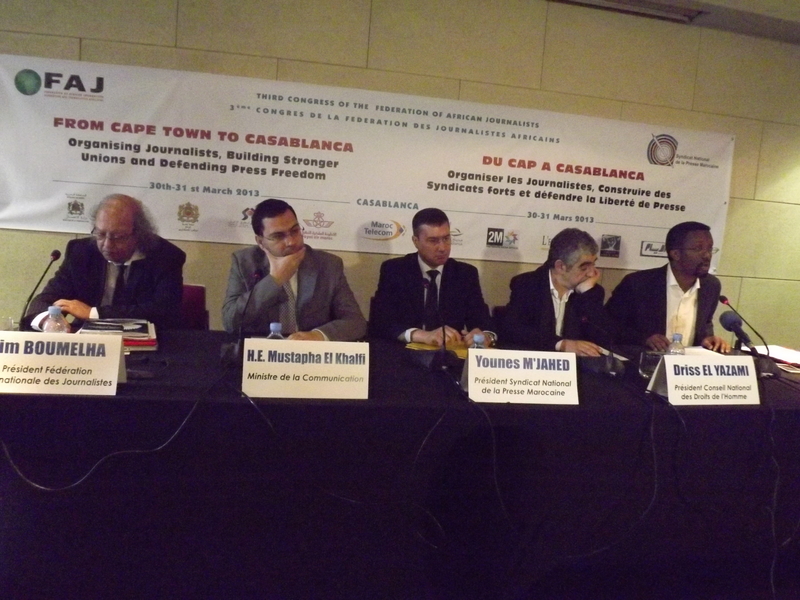 “Africa’s future depends on the emergence of a strong, free and responsible press. This mission involves credible media and respect for press freedom,” El Khalfi said, highlighting the process in Morocco to reinforce press freedom and freedom of expression through a new legal framework provided by Article 27 of the country’s new Constitution which guaranties the right to access to information. Delivering a speech to delegates, Mr. Driss Yazami, president of the national human rights Council of Morocco, said Africa has to take up two challenges: respect for human rights and freedom of expression, and the achievement of a sustainable development and social justice. “The role of journalists is at the cornerstone to meet these objectives and we need to join our efforts to better defend freedoms and the expansion of a human rights culture,” Yazami concluded. Omar Faruck Osman, president of the Federation of African Journalists said the Federation has made tremendous gains since 2010. “We extended solidarity and support to ever combat ready unions and their members; we strongly campaigned for the safety of journalists and tackled the culture of impunity in Africa; we sought justice for victim journalists and their families; we helped strengthen the voice of journalists at the national regional and continental levels. 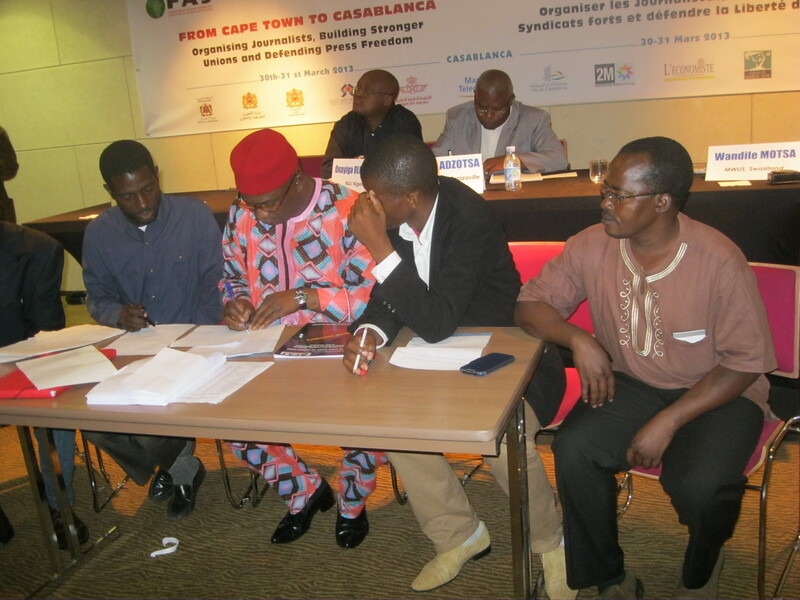 Journalists in Africa and their unions are more organized than ever before. We struggled against all odds in the past three years. We fought to decriminalize journalism and the entire media work,” Osman said. He nevertheless stated that FAJ is meeting in the middle of unprecedented crisis for journalists which threaten to undermine all the gains FAJ has made over the past three years. “Violent repression and the injustice against journalists are relentless. The number of journalists detained in Africa for their work since the last congress has increased. More than 70 % of journalists are working under precarious conditions. Ethical standards are declining due to external life-threatening pressure and lack of decent salaries”, he stated. FAJ has a mandate to enforce trade union development in the media industry in Africa, to address professional matters, to protect and defend freedom of expression and information as well as journalists’ human rights, as laid down in the Declaration of Principles of Freedom of Expression in Africa.